About three billion people worldwide burn solid fuels for cooking and heating in open fires or traditional stoves. The resulting household air pollution causes over four million premature deaths annually and a range of chronic and acute health complications. Inefficient cookstoves contribute to climate change through greenhouse gas and black carbon emissions. 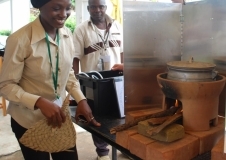 Improved cookstoves use up to 70 percent less wood, reduce emissions by a similar degree, and conserve natural resources. Winrock International works with stove experts to develop new designs and adapt local models for traditional needs.